Let AdvanceWare help assist in the set up of your merchant account! Through our partners at Acceptcreditcards.net we provide merchant accounts that work seamlessly with all our Complete POS Systems and POS Software. Unlimited in-house 24/7 customer support Help Desk for payment processing transaction issues. We take pride in our customer service and are there when you need it. FREE transaction processing configuration, testing and training. NO hidden set-up fees. We will meet or beat quotes from other providers. Give your contact info to your pos rep and Lenny Serrao will contact you within 2 hours. He will go over any questions you may have and get you the paperwork you need. 1. Cardholder presents the card (or the card number, expiration date and security code) to the merchant. 2. The Merchant communicates the card data to their Merchant Account Provider. They use either a credit card terminal, a POS system communicating over the internet or, in the case of an online transaction, a payment gateway, to communicate that data. 3. 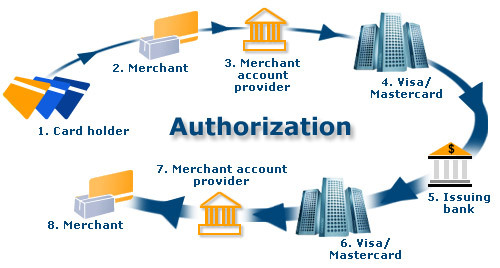 The Merchant Account Provider communicates the card information to the VISA or Mastercard network. Usually this is done via an intermediary, a larger Payment Processor. 4. Mastercard or VISA asks the cardholder's bank (these days usually a credit-card specialist) if the funds are available. If the funds are available, the transaction is authorized and the money placed on hold in the shopper's account (i.e. their available credit is reduced by the amount). 5. The issuing bank tells VISA / Mastercard what the result of the transaction was (either Authorized or Declined). 7-8. The Merchant gets the result and exchanges goods with the shopper. 9. At the end of the day the Merchant sends the day's "batch" of transactions to the Merchant Account Provider. If the merchant is using an Online Gateway or an IP-based terminalthe batching is probably done automatically and is never really noticed by the merchant. If using an older dialup terminalthe merchant probably has to hit a special button to initiate this process. 13. The Issuing bank adds the amount to the cardholder's bill - the merchant no longer concerns themselves with the cardholder, unless there is a Chargeback or a Refund, because they will get paid no matter what. Collecting from the cardholder is the Issuing Bank's responsibility. 14. The Issuing bank transfers the money to the Merchant Account Provider, using an ACH (Automated Clearing House) transfer. 15. Your Merchant Account Provider deposits the proceeds into your business checking account using ACH.